I want to take the opportunity to share with you the exciting coming weeks on the blog as children guest bloggers take over. 30th July- Australian Primary School – No lunches provided in Australia so how do you make packed lunches appealing, interesting and healthy in a hot country? 1st Oct-12th Oct- VEG and family visiting Malawi to visit and meet the children receiving the ‘Friends of NeverSeconds’ kitchen. Guest bloggers invited back to ask questions for VEG to find out to help understand Malawi and the work of Mary’s Meals. Our guests will write in their own language first and English second. We'll also be bringing sound clips so we can hear our guests in their own voices! It's going to some journey. I can't wait to hear from all these countries! It is going to be so exciting to learn about food they eat first hand from school kids. 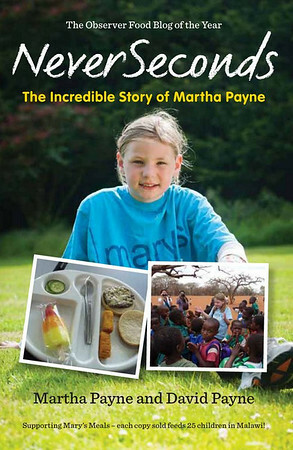 And again, VEG's work with Mary's Meals is one of the most inspiring stories ever. Well done VEG and family! It IS going to be some journey! VERY exciting! What a great job y'all are doing. Sounds amazing, and such a lot of organising and sorting so thank you very much for the time and effort you are putting into this! I just wish to add a vote of thanks to VEG's Dad! A&B unwittingly catapulted NeverSeconds to international fame and a worldwide readership. It's amazing how the Streisand Effect has boosted the charity donations to over £111,000. Whilst its wonderful that this has happened, I suspect Martha's "little blog" has spiralled into something that now requires a lot of coordination and takes up quite a lot of Dad's spare time. The trip to see Mary's Meals in action must have been totally unexpected also. Well done Dad - and naturally VEG as well of course - plus all the guest bloggers you have lined up to contribute. It's developed into a very interesting and unique site. Many of us readers DO realise what's involved and applaud everything you're doing. Hopefully other schools will decide to get involved globally and continue this past 2013. As parents, perhaps we should ask our schools to participate whatever country we are in as I think there are more than 51 schools in the world. It would also be good to see the improvements this has had on school lunches with return visits. I guess we will see where this goes, do we want to see it stop or continue. That is of course Dad's choice. The main thing though is that we continue to support NeverSeconds and Mary's Meals and we keep spreading the word. What a great selection over the coming months and even better in native language with sound clips, looking forward to it. Come on school/college - put yourself forward, please! Wonderful offers coming in and I'm responding to them all. Thanks folks! Keep them coming. Wonderful! This blog is getting more and more interesting. And of course the good work for Mary's Meals. Keep on going! Best wishes to VEG! Grand news to see the upcoming line-up! I imagine neither you nor Veg could foresee how very much learning would be involved in this 'small' food/geography blog. Thank you so much for keeping with through it all, it is very much appreciated! I can't believe this started out as a little project... now look at it! Keep doing it, I alwys read it, you are in my blog roll! I'd also like to extend my thanks to the rest of the Payne family. I'm sure Veg's Mum has taken up a lot of the slack in addition to her work outside the home. I'm also sure that Veg's brother and sister have sometimes felt a bit left out, yet they are very much a part of this, too. Looking at the schedule of where the blog will be in the coming weeks, all I can say, really, is "Wow! What a world tour!!" I've been following the blog since the famous media brouhaha, and as feeble as it may sound I just want to say well done you! I look in each day for an update. You should be VERY proud of yourselves. God Bless! Cant wait and love the blog ! Thanks, that looks like SOME line up! World wide blogging is an awesome idea, and I hope it improves children's meals. I am really looking forward to getting back to seeing primary school lunches here in NeverSeconds! Can't wait for the Finnish week! I teach at Oulu International School and many of our international students don't really like Finnish food. I've found some food that I love (like mämmi) and some that I hate (like salmiakki) and many that are somewhere in between. My favourite lunch is spinach soup with hard-boiled eggs and a Karelian pasty. It is so tasty!